If you want to cut to the chase and just BUY the book, click here. All the facts you need to know about the book. The complete list of songwriters interviewed, along with publishing specifications, cover image, official press release and photo. You can also get contact details for more information. Just click on the book cover for all the information. Read about how Songwriters Speak was conceived and how it all came together. Extensive gallery of photos of songwriters during the interview process, and a step-by-step look at getting to the finish line of this enormous project. Click on the photo panel to start the journey. 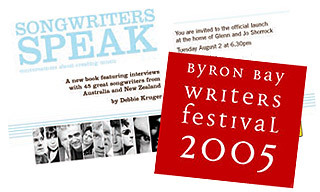 Songwriters Speak was launched at a music industry party in Sydney and also at the Byron Bay Writers Festival. Click on the images to see photos from both events. Read articles and reviews and listen to audio from interviews about Songwriters Speak. Click on the press clippings to find out what the media have to say. The double CD release of Songwriters Speak is available separately to the book. The tracklist features songs written by the songwriters interviewed in the book, not necessarily performed by the songwriters themselves. It's a fabulous compilation and you can find out more about it by clicking on the CD cover. You can buy signed copies of Songwriters Speak here using the secure Paypal system, or find out where you can purchase it elswhere online. Just click on the logo to start shopping. Check out the Songwriters Speak page on Facebook and show your support for the publication of a new expanded edition.